Agroforestry, defined by the EU as ‘land-use systems in which trees are grown in combination with agriculture on the same land’, can help meet the needs of a growing population and protect the environment. It can be used with both crop and animal-production systems and may enhance the supply of regulating ecosystem services, such as nutrient retention, carbon storage, pollination and pest control, as well as cultural services, such as recreation and landscape aesthetics. 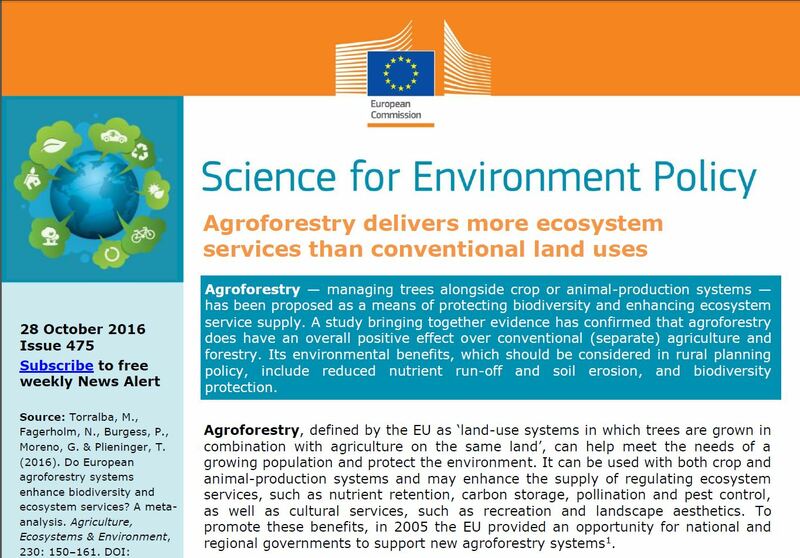 To promote these benefits, in 2005 the EU provided an opportunity for national and regional governments to support new agroforestry systems1. This study assessed the evidence that agroforestry systems enhance ecosystem services and biodiversity, compared with conventional systems, taken from over 20 years of research in Europe. The EU-funded2 researchers assessed all scientific publications that compared agroforestry with an alternative land-use system in Europe, and which included quantitative data and indicators that assess biodiversity and ecosystem services. In total, 53 publications were assessed, which included 365 comparisons across 10 European countries. The effects of agroforestry were measured in two ways: 1.) response ratios, which are a measure widely used for ecology meta-analysis, based on the difference between the value of an indicator (e.g. soil erosion) in an agroforestry system compared to the same indicator in a conventional system; and 2.) Hedges’ g, used on a subset of studies to analyse the effect on biodiversity, based on the differences in biodiversity between plots in agroforestry systems and other land uses. All studies in the biodiversity subgroup were included in the rest of the meta-analysis to assess the overall effect of agroforestry. To calculate the overall effect of agroforestry on ecosystem-service provision and biodiversity, ‘effect sizes’ were used to construct a random-effect model (a statistical model for meta-analysis) and calculate the average effect size. Effect size is a way of quantifying the difference between two groups, in this case agroforestry and conventional management. Positive values suggest positive effects of agroforestry, while negative values indicate negative effects. Results of the analysis suggested that agroforestry significantly improves ecosystem-service provision (average effect size (aes) = 0.43). Compared to conventional agriculture and forestry, agroforestry has a significant positive effect on soil fertility and nutrient cycling (aes = 0.26), biodiversity (aes = 0.3) and especially soil erosion (aes = 2.23). However, there was variation within the findings. For example, while both silvopastoral (agroforestry with grazing animals) and silvoarable (agroforestry with crops) systems have benefits for soil fertility and reducing erosion, only silvopasture systems have a significant positive effect on biodiversity, the results suggest. Among the tree types studied, olive trees, chestnuts, walnuts and cherry species provide the biggest benefits. The researchers also found differences between regions, which underlines the importance of tailoring management to the local context. For example, in the Mediterranean, growing cover crops (non-cash crops planted for ecological benefit) or legumes in vineyards and olive groves is particularly beneficial for soil fertility and nutrient retention. Additionally, positive effects of agroforestry were more evident at the landscape and regional scales than at the individual farm scale. This may have important policy implications, as agri-environment measures are mainly focused at the farm-scale in Europe. The researchers also stressed the importance of nurturing existing silvopastoral systems, such as meadow orchards. They also say that landscape features, such as hedgerows, should be promoted, as they can help to conserve biodiversity, create barriers to wind, increase soil fertility and control pests and diseases. The researchers say agroforestry could be a ‘strategically beneficial’ land use in rural planning and particularly effective in addressing biodiversity loss, run-off, soil erosion and nutrient loss. However, its complexity needs to be properly considered by policy. While the Common Agricultural Policy encourages national governments to support new agroforestry systems, many have been reluctant to do so, perhaps because funding is less than for afforestation projects, the study’s authors suggest. Source: "Science for Environment Policy": European Commission DG Environment News Alert Service, edited by SCU, The University of the West of England, Bristol. Authors: Torralba, M., Fagerholm, N., Burgess, P., Moreno, G. & Plieninger, T. (2016). Do European agroforestry systems enhance biodiversity and ecosystem services? A meta-analysis. Agriculture, Ecosystems & Environment, 230: 150–161.